Nearly three decades ago, a tiny Tahitian land snail called the Partula nodosa was declared extinct in the wild – only 26 individual snails remained. In a final attempt to save the species from being completely wiped from the Earth, those 26 snails were sent to the Detroit Zoo as part of a cooperative breeding program. Animal care staff worked carefully to provide the best possible living conditions for the snails while focusing on their successful reproduction, which eventually resulted in the rescue and recovery of the species. Thirty years later, there are now more than 6,000 individuals living in North American zoos, all descendants from the original group that came to the Detroit Zoo. In the last two years, 160 of these snails have been sent to Tahiti for reintroduction in the wild. Visitors to the Detroit Zoo can become a part of this story at Shelle Isle, an exhibit in the Wildlife Interpretive Gallery that features the conservation story of these tiny mollusks. Guests are transported to the Tahitian rainforest, surrounded by tropical plants. A short video tells the snails’ story from a stable population in the first half of the 20th century to their sharp decline in the late 1970s, when an attempt to protect farmers’ crops from African land snails went awry and the Florida rosy wolf snails that were introduced to control the population preferred to eat the Partulid snails. The video also includes footage from the release of the Detroit-bred snails in Tahiti in 2015. Guests are invited to feel the shell of a giant replica of the Partula nodosa and more closely observe its structure and form. 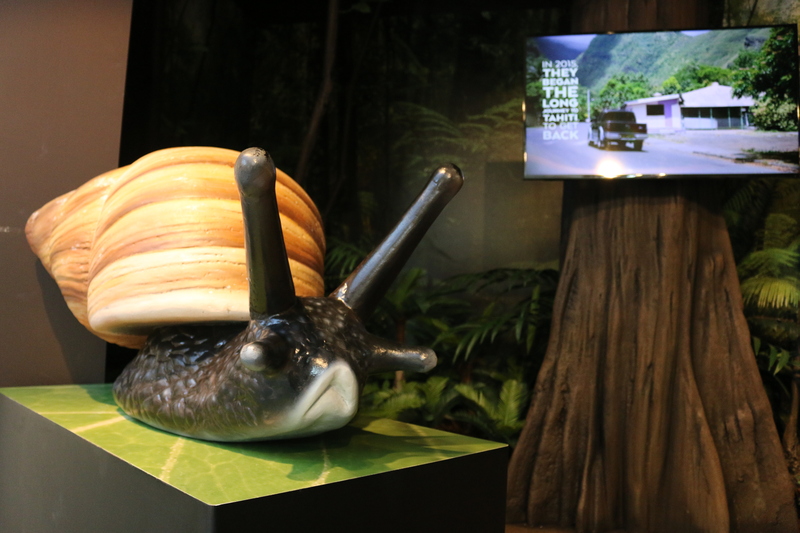 A second monitor has a live camera feed into the p. nodosa habitat in a behind-the-scenes area at the Detroit Zoo, giving guests a glimpse of the snails’ daily lives. A favorite feature in this space is a large, “fallen” log where tiny, exact replica snails sit. Two magnifying glasses attached to the log allow visitors to get a close view of these tiny creatures. Many of them have a yellow number painted on their shell, which represents the way the snails are tagged by scientists before being released in Tahiti in order to monitor their movements and survival. The few that don’t have numbers painted on them are meant to demonstrate the successful reproduction in the wild that researchers have already observed, and the project’s continued success. For us, an important part of this story is that it focuses not on a charismatic megavertebrate, but on a species that is not well-known, isn’t found on nursery walls or represented in the rows of stuffed animals on a toy store shelf. 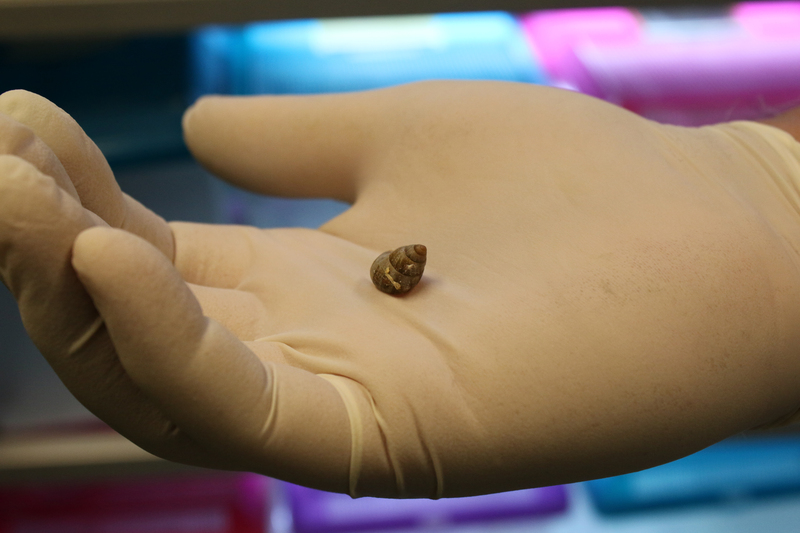 Conservation is not a beauty contest; all animals are important and the Detroit Zoological Society (DZS) works tirelessly to conserve species large and small – including the tiniest and slimiest of snails. By supporting the DZS, you are a critical part of this important work.